Every time I visit home (only twice a year), I find my younger (teenaged) sister, has managed to give her computer a "virus". 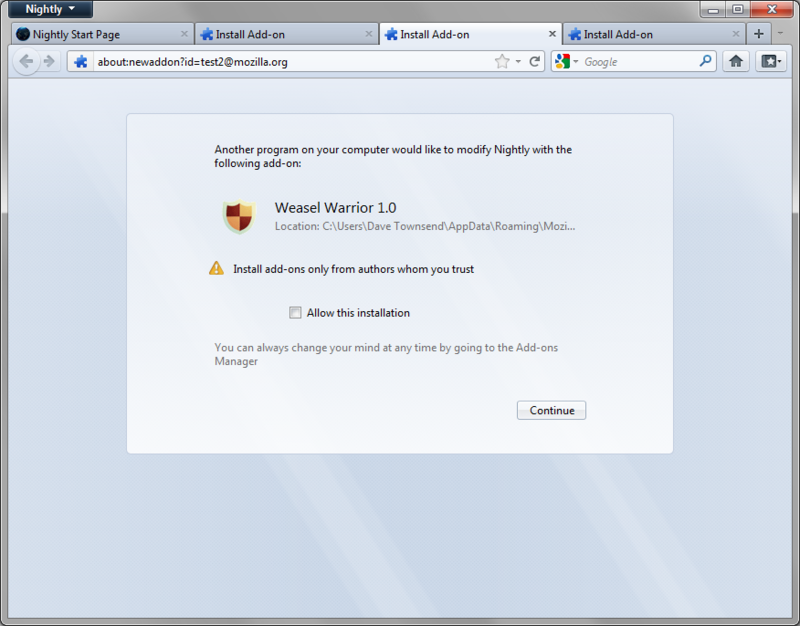 Almost inevitably this isn't true virus, but is a malicious browser extension adware. They have popups, and change the search provider and homepage. Most recently is was ShopperPro, I believe these are largely being installed by her installing freeware that bundles them "Free" extras. and installed them as part of its installer. Similar to the Free Tool bar plague that was (still is?) common back with IE6. Is there a method I can use to block the installation of Browser Extensions? My sister is not a technically adept person, she's never used a browser extension intentionally, and probably never will. I would rather not give her a restricted account, on her own computer. I have no desire to be her full time system administrator, just to reduce my work when I visit. Possibly a extension exists which makes all other extentions installed, be initially set to disabled? My current idea is to rename the Chrome (Safe-Mode), to Chrome so that she can only start it in safe mode, but not being a chrome user myself I don't know if that will have other side effects. You could also try to set up an administrative policy to disable extensions (see documentation). It might be more flexible, but I can imagine that malware developers would modify these policies themselves. Your sister has probably more to worry about if she blindly installs adware/malware. Some education about the risks of her behavior might be more effective than disabling extensions in Chrome. You could use Spybot: Search & Destroy, which has a browser protection feature. It also protects the start page from being changed. You could also use Ninite to install and update some of the most popular freeware and open-source software adware-free. I think the best way would be to change to firefox, since the opt-in feature is relatively foolproof (this window appears every time a external application installed an addon and if the user doesn't opt in the addon gets deleted): However I've heard that some malicious adware manipulates this dialogue, but this seems to be quite rare. In Win7 Ultimate (and probably most other versions of Win7), you have to download and install Google's Administrative Template manually before you have access to Google's GPO settings. Although this may not be true anymore because I installed Chrome years and years ago and have only been updating it; The new installer may automatically add the Template now but I doubt it. DL and unzip Google's Administrative templates, Then add the template for Google Chrome manually: Right-click Administrative Templates and select Add/Remove Templates then browse to where you Downloaded and Extracted the policies and add the one for your region. Next go to Computer Configuration > Administrative Templates > Google > Google Chrome. Look for a folder named Allowed extensions. There configure a blacklist of *. This will prevent users from installing plugins. WARNING! It will also block all currently installed plugins! Or if you have some extensions you use regularly you can use the Whitelist instead and only authorize the ones you want in a similar way, just add the Extensions' IDs to the whitelist. I have a feeling this won't work for the really nasty, virus-like extensions, however, because I noticed that my AV's Browser Extension from Avira somehow overrides this in both Blacklist and Whitelist mode, but I haven't ever had any problems after I whitelisted what I wanted. Not the answer you're looking for? Browse other questions tagged browser malware google-chrome browser-addons windows-vista or ask your own question. Prevent chrome from installing new extensions? Chrome extension or Firefox addons that replaces text on page? Can a virus/ malware still linger if the symptoms of installing the virus are gone after system restoring to an earlier point? How to bookmark favorite addons from opera addons? How to sync installed addons from opera addons?